Even though we have been home for 3 weeks since our holiday the legacy lives on. We returned fresh and invigorated with lots of ideas and plans. I don’t know about contempt from the phrase, “Familiarity breeds contempt” but I do know that being away from your normal environment allows you to consider things with fresh eyes. We had time to really ponder and discuss all sorts of possibilities including what we want to do in the garden, future holiday plans and retirement activities as well as some of the smaller things we hope to achieve around the house before the end of the year. There seemed to be so many times in conversation that GMan would comment, “We need to do/get/make……….” that I would simply respond with, “Add it to the list”. Although we did not have a physical list, we certainly remembered plenty of things and have actioned several since we have been home. I know there have been others but this gives you an idea. Then there are others which are earmarked to be done this week. By planning very specific small projects/goals it is very satisfying to work through the list. I wrote this post last night and today we managed to cross 3 more items off the list. I am sure there will be more to add by tomorrow. Tonight I want to share a germ of an idea that has formed gradually over a period of time. Some people have an ongoing shopping list to which they add items as they find that they are required. Others keep a list of what is stored in the freezer and cross things off as they are used. I am thinking of creating a laundry list. I have this cupboard in my laundry. 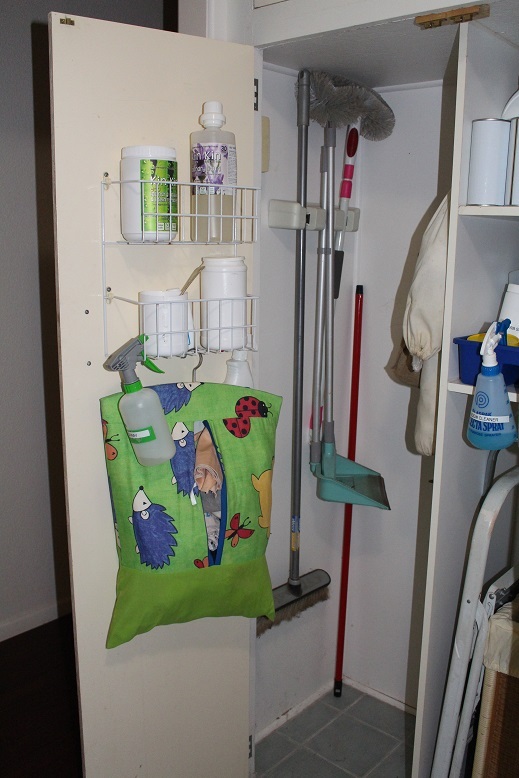 On the left-hand side are the assorted brooms and the vacuum cleaner (not shown), hangers for knitted items and dispensers for plastic bags as well as the racks on the inside of the door for laundry liquid and presoak and the rag-bag. The right-hand side has the laundry hamper with shelving above. 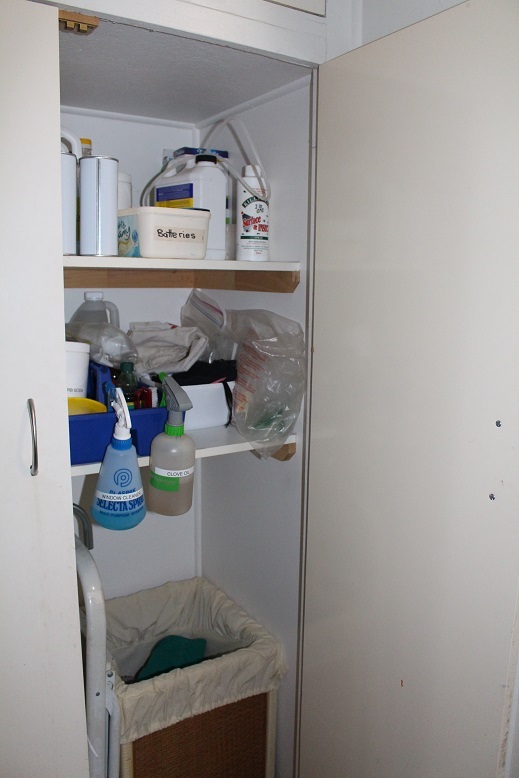 This holds various cleaning items as well as spare light globes, batteries, rubbish bags and shopping bags. However, the door is clear and this is where I could put my list. I envisage a write on/wipe off board and am thinking of making one myself from a sheet of coloured A4 card and laminating it. So, what am I going to write on this list, I hear you ask? It will basically be a reminder of extra jobs that need doing such as ‘stain on white trousers’, ‘scrub cuffs of mauve shirt’, ‘hem of black skirt’ or ‘darn striped sock’. They will be all the little things that seem obvious at the time but by the time I am doing the washing/ironing it can be overlooked. What do you think? How do you keep track of the extra laundry jobs? I have started to get my Christmas list which was in my head, down on paper. It is not a list of what I want but a list of Christmas related activities and tasks. I need to check that nothing gets forgotten. Over the last few years it has become an unwritten rule that nothing overtly Christmassy happens until after 3rd December. The significance of this is that it is Miss O’s birthday and I think that it is important to be able to focus on her special day and not let it become overwhelmed in the lead-up to Christmas. Our darling turned 5 yesterday so has the adventure of starting Prep and the whole new world of school next year. I am sure there will be other things to add to the list but that is the main focus for us. Christmas lunch will be for 4 adults and 4 children (aged 6, 5, 5 and 3). It will be gluten-free/ grain-free (in line with my eating plan). I will write more about this in another post. The Christmas tree will go up on Saturday afternoon when Miss O and Izz are here. I need to get serious about finishing the Christmas letter which is half-written. Many of our Christmas greeting are sent via email but I would like to get the cards in the mail by the middle of next week. The gifts are an ongoing project which is coming along nicely. I think I have planned gifts for everyone – just need to check the box in the spare room again. Nothing is wrapped yet. In fact, I will not be wrapping gifts this year as I have made re-useable gift bags in assorted sizes from Christmas fabric. I won’t miss the piles of ripped wrapping paper all over the floor on Christmas morning. We will be going the see the Christmas lights on Saturday evening when our granddaughters come to stay. Once I find the time and date of the carol service I will organise to go with Miss O and Izz. Writing everything down helps to clarify exactly what I need to do and when. We have a fairly simple, low-key Christmas which is naturally focused on enjoying it with the children. Over the next week or so I will post about each of the things on my list in more detail. When do you start your Christmas preparations? How are you going? Please share your plans. It is amazing the difference that a couple of days and a written list can make. I feel as though I am making some progress now. Here are a few more things that I have thought of and added to the original list. Being able to cross things off the list adds to the sense of achievement and produces a sort of calm. I know I can do it. I will be completely organised and ready to leave in a little over 5 weeks. With less than 6 weeks now until we head off on our trip it is time to really focus on what needs to be done. The only way I can confidently achieve what I want to do in a specified time-frame is to have a list. For the past few days while I have been busy with Miss O and Izz, I keep thinking of things I need to do. That will do far a start. I will update you as things are crossed off. I find it much easier to have a written list than to have ideas floating in and out of my head when I am least able to deal with them.